These almond cookies are quite amazing on their own. They have a soft, chewy consistency, a crispy edge and are 100% gluten and grain free. THEN, there’s the frosting… A blend of healthy fats from the avocados and cacao butter. The combination of the two make an incredibly smooth and creamy frosting that is not too sweet. For sure this is something that is not typical of other frostings… The raw cacao powder gives this frosting a rich dark chocolate flavor and increases the nutrients and vitamin content of these cookies. Did you know that the flavonoids found in dark chocolate increase blood flow to the brain, helping to improve your memory?! 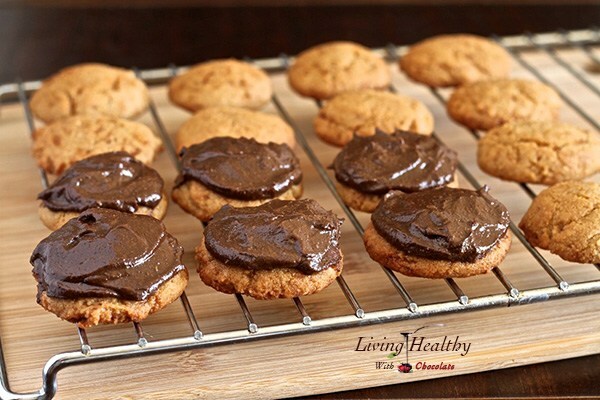 Yes, it is true…so go ahead and enjoy these cookies as a healthy snack! The Almond Cookies are gluten and grain free, also dairy free and refined sugar free, made with almond flour, coconut milk, coconut oil, raw coconut palm sugar, vanilla and eggs. in a blender or food processor, blend the chocolate with the avocado to form a creamy frosting. You can adjust the sweetness of the frosting to your liking by adding more honey.